BUCKTOWN — Chicago's next great park, The 606, and the elevated Bloomingdale Trail that runs through Wicker Park, Bucktown, Logan Square and Humboldt Park was hit by Mother Nature Monday as massive storms pelted the city during Game 6 of the Stanley Cup Final. Instagram user blipsman posted a photo Monday evening, on the eastern end of the trail in Bucktown. 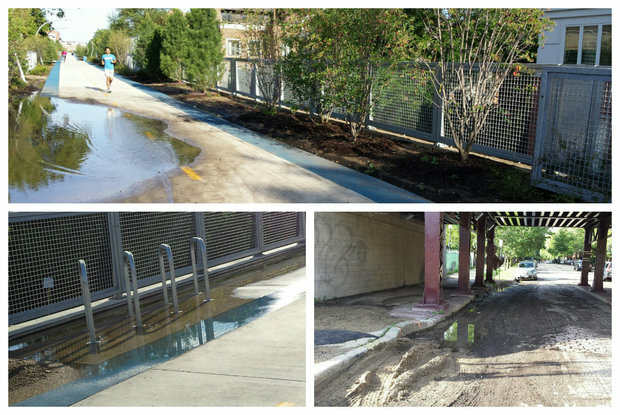 "Apparently there are no drains on The 606," he commented. Farther west down the trail, near the Rockwell exit in Humboldt Park, neighbors on the 1700 block of Talman Avenue whose homes are directly next to the trail were battling flooding as they had during the construction of the trail, according to Erin Bottcher, who has a view of the 606 from her porch. "It is caused by something new that is coming into the walls from different spots for different reasons," Bottcher said of the flooding. Bottcher's neighbor was unable to be immediately reached, but Darin Hohlmer, another resident who lives along the trail, took to Facebook to complain. 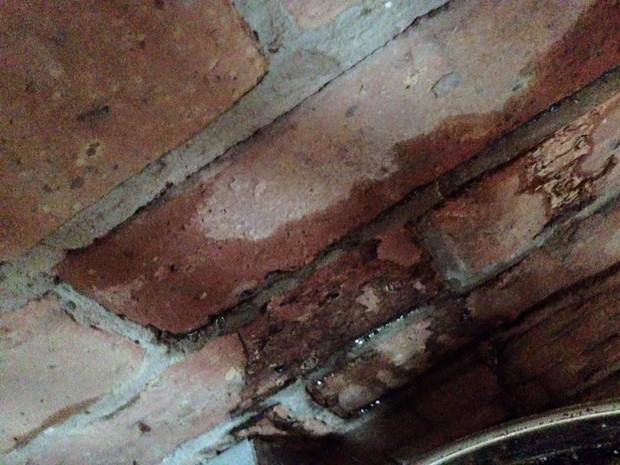 "Who was in charge of safeguarding residences on the trails property we have lived here for 25 years with no incident now we have muddy water seeping through our brick and under the bamboo floors! Seems as though they have done structural damage to our foundation..now what?" Hohlmer asked. Hohlmer lives in the 1700 block of North Mozart Avenue, just west of the California Avenue ramp. Chicago Park District officials were not immediately available for comment. On Tuesday afternoon, Michael Claffey, a CDOT spokesman, issued a statement. "This storm dropped anywhere from 2.5 to 5 inches of rain across the area over just a few hours last night. We take residents’ concerns seriously and are looking into them. However, we can’t speculate as to any specific causation for the flooding aside from heavy rainfall at this point. Currently, the trail is open and fully accessible at all access points," Claffey said. Another Humboldt Park neighbor, Jason Walker, described his basement as "bone dry, despite the heavy rain." "I live right next to the trail. There's been heavy machinery at times, and some shaking, but no more than next to any other construction site," Walker said. When asked if he has heard from Bloomingdale neighbors impacted by the flooding, late Monday Ald. Scott Waguespack (32nd) said, "We had more than two dozen serious flooding locations by viaducts and we're trying to clear them but a lot of them need vacuum." Damen, Fullerton and Webster avenue viaducts under the Kennedy Expressway, all far north of the trail, were under water and impassable for some cars late Monday. Early Tuesday, the entire trail, save for a few puddles was totally clear. Joggers, walkers and cyclists were enjoying the trail around 7 a.m., as workers from Christy Webber planted new trees along the California Avenue ramp. At Julia de Burgos Park, 1805 N. Albany Ave., mud from the rain had slid off of the embankment and into the playground area, uprooting some newly planted greenery. A worker from the Park District said he has snapped a picture and sent it in to his boss. "The contractor should have put a wall here," the worker said. At a viaduct under the trail in the 1800 block of North Paulina Street in Bucktown, the pavement around a sewer manhole had caved in. "It's an emergency ticket, two hour-deadline. A normal ticket has a two-week deadline," said a worker from USIC, a utility locater firm. The worker was spraying bright yellow stripes onto the ground to show where the gas lines were and was helping drivers and cyclists to safely get past the construction. The roads beneath the trail are in the process of being repaved, according to a construction update by project organizers.